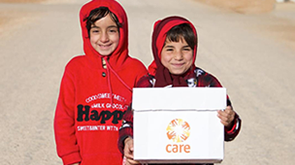 Nominate CARE for your university RAG week and raise funds to help us support people in need throughout the world – whether it’s helping people hit by disaster or crisis, supporting refugees or helping achieve gender equality and women’s empowerment, you can make a real difference to people’s lives. If you’re planning a student event, jailbreak or bucket collection, we want to hear from you! Our dedicated Community Fundraiser will assist you with fundraising inspiration and resources you may need, such as posters, case studies and collection buckets. You can even set up your very own CARE society at your university to get like-minded people together to start something amazing! Please get in touch to get your university involved.